Luffy and Hancock arrive at the underwater prison of Impel Down, where the Snake Princess uses every ounce of her beguiling charm to smuggle him past the guards. Once inside, unexpected alliances help Luffy survive the increasingly dangerous levels of the prison. At the depths of it all lies the poisonous Warden Magellan whose toxins put the rubber-man’s life at stake. It’s up to his new allies to save him by tracking down a miracle worker rumored to have vanished into the gates of hell. Enter Ivankov. This larger-than-life personality has the Healing Hormones needed to save Luffy, but the cure could take years off the pirate’s life! With his brother just beyond reach, Luffy must take the ultimate leap of faith before it’s too late. 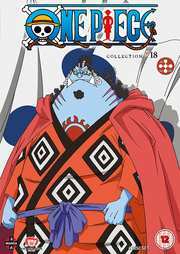 One Piece Collection 18 contains 422-445.